With Surimi imitation crab! Oh boy! 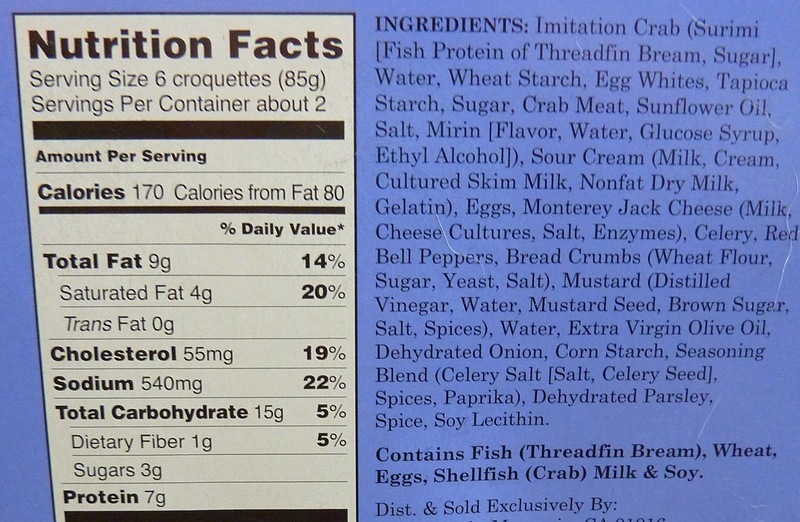 That's the best imitation crab meat of them all! Or so I might believe after perusing the cover of this product. I've actually never heard of Surimi until now, but I have known for a while that a lot of times "crab meat" is actually nothing but fake crab meat that's really only dressed-up fish. I just find it funny that TJ's advertises it so boldly on the cover of the product. 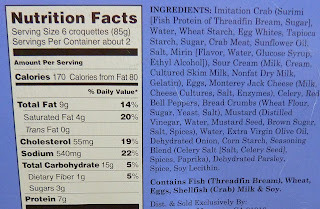 Well, it does say "seafood croquettes," not "crab croquettes." 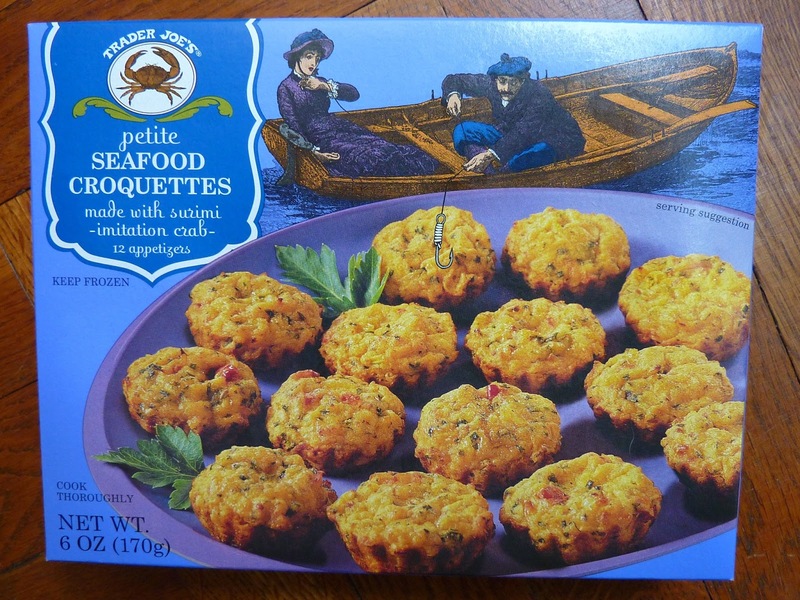 And really, I think if it were real crab meat, they'd just go ahead and call them "Petite Crab Cakes" or "Mini Crab Cakes." But I do get caught up in the semantics too easily. It's the English major in me. 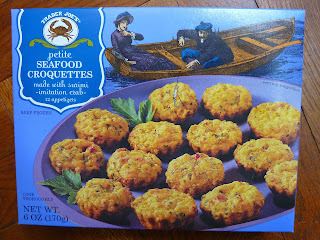 to call them would have been "Imitation Crab Cakes" or "Surimi Cakes." But what marketer would put the word "imitation" in the title of a product? One who's slightly crazier than the one that put "made with surimi imitation crab" immediately below the title of the product. They're slightly firm on the outside, and significantly softer on the inside. You can taste things like peppers, celery, and cream in the mix. It's actually a good bit like Thanksgiving stuffing...mixed with fish. They're not very spicy, but you can detect a hint of seasoning. All in all, not a bad appetizer, but there are plenty of hors d'oeuvres I'd take over these. Sonia gives them 3.5 stars, adding, "They were a little too eggy for me, even though I like eggs." I didn't notice the egginess so much, but I give them 3.5 too, because they were snackable enough, but not particularly memorable. A little late to the party on this post, but I highly recommend the a dab of TJ's wasabi mayo on these bad boys. They really brighten up the flavors and add a nice bite to the otherwise mediocre "krab kakes."